I was introduced to Processing by Andy Engel, a grad student here at Wayne State. Â I also got to see Processing in action at Johndan Johnson-Eilola‘s CCCC presentation. Â In addition, the CCCC 2011 paper I proposed is about Processing. Johndan uses Processing to introduce students to programming concepts, and I’m thinking of doing the same thing in a future course entitled “New Media and the Future of Writing.” Â In that course, I’d like to teach an entire unit on code/coding. Â The Processing software comes with a number of programs, so students can examine and tweak working code. Â It also allows programs to be quickly compiled. I’m still trying to come up with a more complicated project for myself. Â I’d like to make something with Processing (and people have made all kinds of things, including games), but I’m still trying to figure out what to make. 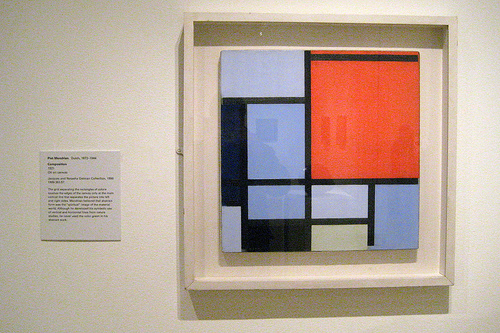 Â The Mondrian was a simple project, and I’m not actually sure if I’m capable of something all that complex. Â But I’d like to give it a shot. Suggestions are, of course, welcome.